On average, April 27th is the first day when the high temperature in Nome rises above freezing, for the first time since October. Although we�ve had a few days as warm as the +30�s this winter, we�re still due a few more bitterly cold ones, and almost certainly more snow. Still, we look forward to the eventual arrival of spring, and as we do, we thank God for your faithful help and your prayers. 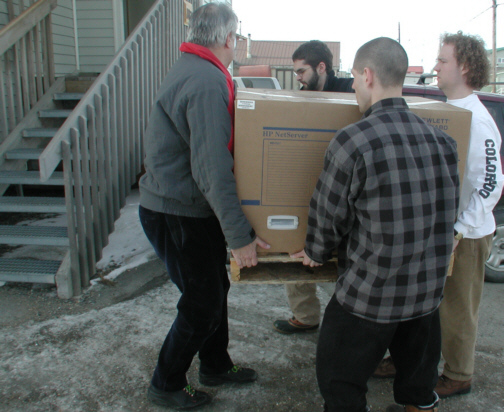 BOXING DAY: (left) With an extra sprinkle of sand for good footing, KNOM�ers Ric Schmidt, Tim Bodony, Paul Korchin and John Hall carry the new KNOM file server computer into the studio building. By mid-May, this 200-pound computer will control all of KNOM�s studio audio. 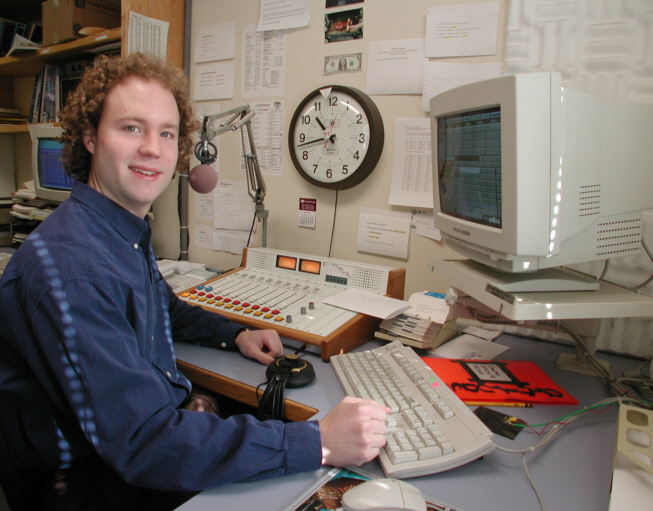 The unit is part of an upgrade to our computerized studio system, necessary because the company which builds it no longer supports older systems such as the one KNOM has used since 1994. Watch for more information in coming months! You�ll notice that the crew�s mostly in shirtsleeves. March 28th, the temperature was a mild +14°. LONG DISTANCE CALLS: In March, a call-in program discussing school discipline garnered calls from the Yup�ik village of Ekwok (EKK-wahk) and from a satellite telephone along the Kvijack (KVEE-jack) River, about 500 miles southeast of Nome. We are aware of regular listeners from as distant as 800 miles away. Most of them live in extremely remote points. Thank you again for allowing us to provide them an award-winning service of inspiration, education, news and companionship. INSPIRATIONAL SPOT: When we think we know what God wants for us, we plow ahead without seeking His direction. We can try our hardest, use all our talents and resources, but it means nothing without God�s guiding Hand. God�s way. God�s time, not mine. INSPIRATIONAL SPOT: Resistance to prayer is like the resistance of tightly clenched fists. These hands show tension, a desire to cling to self, a greediness that betrays fear of change. Open your hands. Let go of resentment, addiction, frustration, bitterness, or jealousy. Open your hands, pray, and let the wounds in your life heal. top �WIRE� WE DOING THIS? 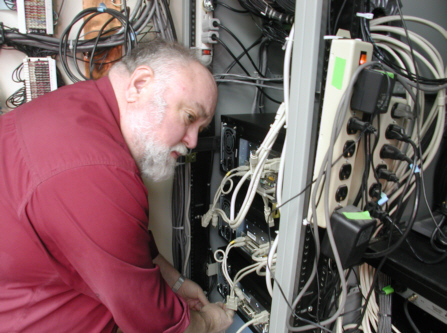 (left) KNOM engineer Les Brown begins to install four of the new computers in a downstairs hallway equipment rack. Note the temporary power wiring at right, keeping us on the air during the work. Within a week, Les will have it neat and orderly. (Left) Here's an image from the other side of the equipment rack, as KNOM volunter Julia Arrotti checks out the first three computers to be installed. These racks front into KNOM's main downstairs hallway. Radio engineers will recognize equipment in these three racks. The computer screen and keyboard at left control our remote AM transmitter, on the tundra 3 miles east of Nome. 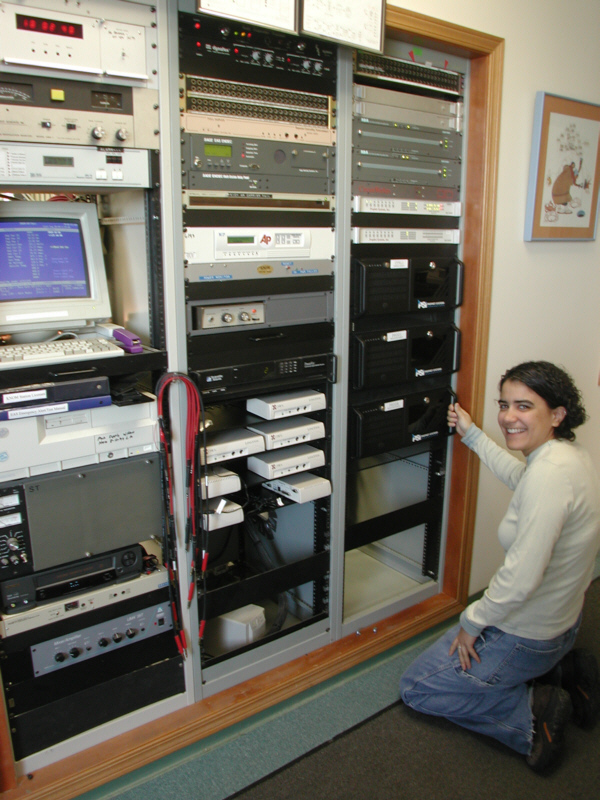 Other gear includes amplifiers that distribute audio signals throughout the studios and our Associated Press satellite receiver. FOOD FOR THOUGHT: Recent topics discussed in KNOM newscasts, interviews and other programs include school administration, the role of social workers, the history of Native music and dance, cultural changes in villages, regional health inspections, and the phenomenal popularity of basketball in rural Alaska. Every week during the legislative session, KNOM interviews a member of the Alaska State House or Senate on the many issues of interest to western Alaska. Thank you for making these important and informative programs possible. �GAMBELL�-ING: Hats off to volunteers Andrew McDonnell and Ryan Conarro, who covered the village of Gambell�s spring festival at the end of March. 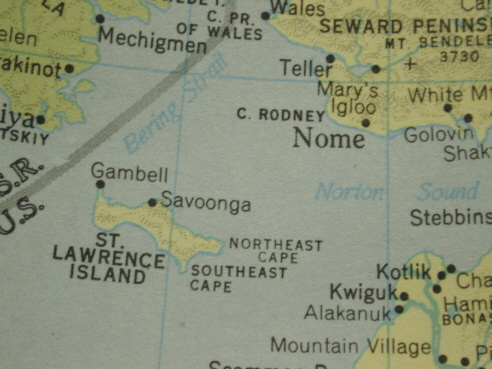 At the western tip of St. Lawrence Island (left), Gambell is 200 miles from Nome and only 35 miles from Russia. You�ll hear KNOM in its 153 homes all day. Like their ancestors, the Eskimos of Gambell primarily feed their families seal, fish, walrus, whale and eggs from sea birds. Store-bought food is three to four times more expensive than in the Lower 48. Ivory carving and other home-based Native art are the principal occupations. Few families have extra money, and according to the U.S. government, half live in poverty. INSPIRATIONAL SPOT: The greatest peace I�ve ever known, I found in troubled times. For when I put my trust in God, He eased my troubled mind. top CONGRATULATIONS to KNOM program director Ric Schmidt (left). 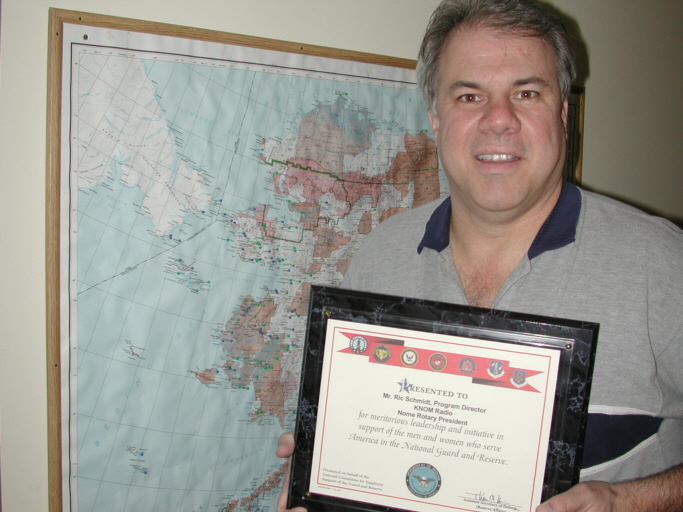 Ric is one of four Nome individuals to be honored by the National Guard for supporting their work in Alaska, both before and after September 11th. The plaque is signed by Assistant Secretary of Defense for Reserve Affairs Craig Duehring. Ric, who is also president of Nome�s Rotary Club, was presented the award at one of the group�s weekly meetings in March. ANOTHER AWARD (SORT OF): It�s the closest we�ll ever get to an Academy Award. Last year, when KNOM volunteer Ryan Conarro was a student at New York University, he worked as an extra for the auditorium scene in �A Beautiful Mind,� which won the Best Picture Oscar last month. If you know when and where to look, you�ll catch Ryan in the movie for about two seconds. According to Ryan, his mother missed the shot. At the very moment Ryan was on the screen, she turned to his dad to mention that she hadn�t seen him yet. UP FOR THE COUNT: So far this year, KNOM has broadcast approximately 14,100 inspirational spots, and an equal number of educational ones, thanks to you. Your gift can make an immense positive difference for many years into the future. INSPIRATIONAL SPOT: Love multiplies joy and divides grief. top THIRTY YEARS AGO: In April 1972, KNOM provided a bit of logistical help for a crew filming a Walt Disney movie in the Nome outskirts. All of the actors were cast from Nome for the film, which was released on television as �Two Against the Arctic� three years later. It featured beautiful photography of springtime on the Alaskan tundra. The plot? Two Eskimo children are accidentally left stranded on an arctic beach while their father hunts on the ice. They overcome many obstacles as they journey sixty miles to their village. One of those obstacles was a polar bear. Rather than hire �a local,� the company brought in Igloo, a trained polar bear from Seattle. In one shot during the critical polar bear scene, producers stuck willow branches in the snow to block the camera�s view of the KNOM tower. (Left) KNOM volunteer JOHN HALL prepares a newscast. Every day, you�ll see John, Julia Arrotti and news director Paul Korchin recording and editing interviews and producing newscasts. WHAT A YOLK! Easter was gray and windy with snow in the air, and KNOM�ers smiled to watch a hundred toddlers scrambling on Nome�s tiny ice rink (a flooded lot), slipping and sliding, bumping into each other, and having a wonderful time thanks to the town�s Veterans of Foreign Wars. It was so cold that the Easter Bunny had to wear a down vest. We thank you once more for your prayers and your financial assistance. You are our strength. Without you, our mission work would quickly cease. From all of us, we wish you a happy spring. We keep each of you in our prayers. May God greatly bless you for your generosity. Thank you again! INSPIRATIONAL SPOT: Every child is an undiscovered source of wisdom.